Based on my first review of Ben & Jerry's entry into the Greek yogurt, albeit frozen, war, I was less than excited to dive into this pint of Strawberry Shortcake Greek frozen yogurt. It's not that the last one was bad, but it just wasn't good or memorable and when you are paying premium prices for Ben & Jerry's products, it better be both of those things. Since I picked up two of these pints, along with that Blueberry Vanilla Graham pint, I had to make my way through this one as well and that leads to this review. This Strawberry Shortcake pint was also picked up at Meijer on sale for $3.00 and is 180 calories per serving with the typical four servings per pint. This product is described on the pint as "Strawberry Greek Frozen Yougurt with Shortbread Pieces" and as you can hopefully tell from the pinkish hue in my pictures, the Greek yogurt is actually (at least visually) strawberry flavored. 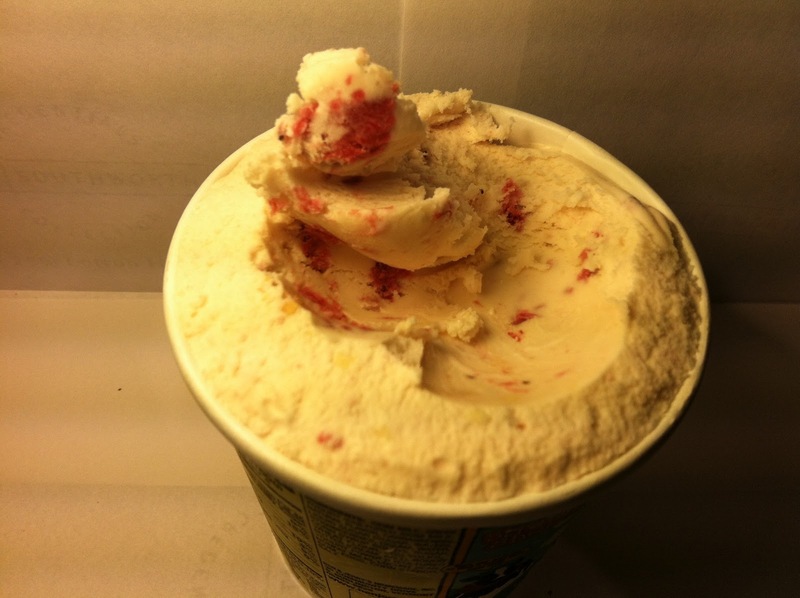 Also in the pint are a plentiful amount of frozen strawberry chunks, which were unexpected due to the description, and also a plentiful amount of shortcake pieces. The pieces were not large, but they didn't need to be as there was a good amount of them spread throughout. Based on number and size of the mix-ins with this pint, it certainly was off to a good visual start and compared with the Blueberry Vanilla Graham pint that I tried previously, this one had me a bit more interested and less disappointed as I dug in. As I did dig in and grab my first spoonful, I noticed the same thing about the "Greek" yogurt in this as I did in the last pint: it didn't taste like Greek yogurt at all. It just tasted like a soft and creamy frozen yogurt, albeit a strawberry one. The strawberry flavor was definitely present, but wasn't overly strong or sweet. It was just pleasing. The nice-sized strawberry chunks also amped up the strawberry flavor level of this pint and while I am not the world's biggest lover of strawberries, I did certainly appreciate the nice chunks as I came across them. The real winner here was the well spread shortcake pieces though. They were soft and flavorful and honestly, they made this pint work fairly well according to its description. I've always been amazed at how ice cream manufacturers are able to keep some mix-ins from becoming rock hard and these shortcake pieces added to my long list of amazements as their softness mixed with the hard strawberry chunks and the mild strawberry yogurt made for a delightful treat. Buy It or Fly By It? This certainly wasn't a great pint of frozen yogurt, but it was pretty solid and for that, I'll give it a BUY IT rating. It certainly was better than the Blueberry Vanilla Graham flavor and while I'm not entirely a fan of this Greek yogurt line of products, I can definitely say that given the option, I would recommend this one as your first pint to try. Not sure if I'll buy it again, but I did enjoy it enough that I did not regret the purchase. Perhaps you'll develop slavish devotion to this after trying it yourself, but I just don't see myself going that route. That's is great that it is "visually flavored," as you put it. I think so much of taste is based off the expectations you get from your other senses (sight/smell/etc). I if it does not look tasty, then we are already setting ourselves up for defeat. Even in the IronChef world, plating is one of the 3 ways a chef is judged. It is nice that this product hits both marks. Agreed - this one is good but not great. 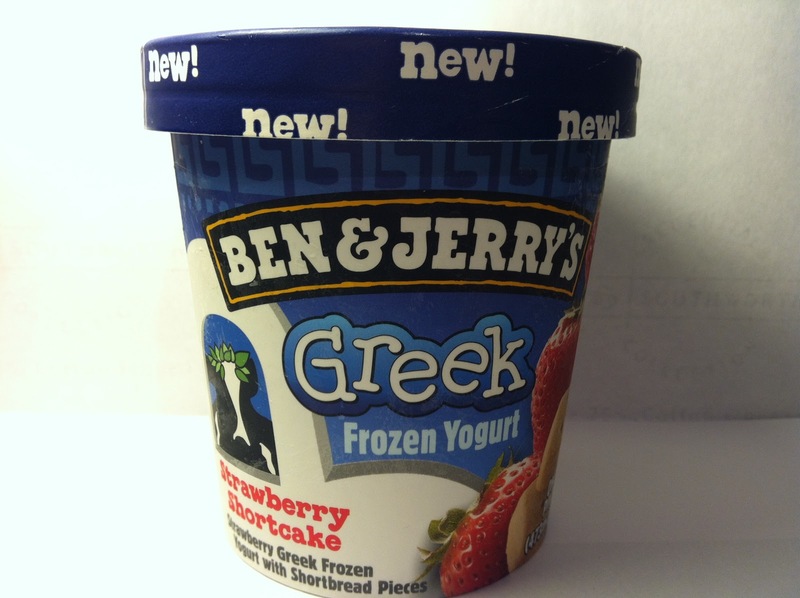 Have you tried the banana peanut butter flavor of Ben and Jerry's greek frozen yogurt? Definitely my favorite.